Here’s this week’s Poker 2 Nite episode on Versus, featuring interviews with Annie Duke and Olympic snowboarder Hannah Teter. The Winter Olympics get underway today, and we thought PokerStars you might appreciate some heads-up on who out there on the slopes, in the rinks — and hopefully on the medal stand — knows a thing or two about Texas Hold’em. Hannah Teter, the Annette15 of Snowboarding? Shaun White isn’t known as much of a poker player, but here’s a picture of him at the poker table. For more information on these athletes, including photos, videos and the full schedule for the 2010 Olympic Games, visit www.NBCOlympics.com or www.TeamUSA.org. In preparation for the upcoming Vancouver Olympics, US figure skating champ Johnny Weir skated to the song about bluffin’ with muffins for an exhibition performance at US Nationals last week. Glad to see that the word about poker/lesbianism is still spreading. We regret offending the handful of commenters who believe we should either not be reporting on the outcome of a news event like the World Series of Poker, or should have dumbed-down the headline so as to not give away the outcome on the Sports front page. However, we believe you are in the minority. The traffic to the site today — in which the coverage of the World Series of Poker has received more page views than any other story in Sports — suggests the majority of readers are interested in knowing the outcome now. We confront a similar issue every two years with the Olympics, in which some users suggest we are ruining their evening by covering the outcome of news as it happens instead of letting them learn who won by watching television’s tape-delayed coverage. In both cases we feel we are serving the greater good with immediate coverage. In this day and age, in which information is available everywhere and much of it instantaneously, it is almost impossible for a news organization to NOT report news when it knows it — because someone else will. Indeed, USA TODAY is not the only news organization reporting the outcome of the final table. Fox, CBS, Yahoo, every Website that subscribes to the Associated Press, radio, TV… even ESPN itself has coverage of who won. Unless you get your sports news from www.headinthesand.com, and only that site, how were you planning to make it through the day consuming news and information without stumbling upon the final table outcome? If USA TODAY does not tell you who won, we know that most users will just go elsewhere to find out. Not every user wants to wait, and not every user plans to watch it on tape-delayed television. Similarly, we would be at a competitive disadvantage to tell users in our headline that the event is over without revealing who won. While some users may have entered our site at our homepage or Sports front and discovered the news, almost half of our traffic these days comes from search engines — people who increasingly start at Google or Yahoo and type in search terms. The more specifics we get into our headlines, including the name of the winner, the more likely we can attract the audience that is searching for that news. It’s not the same as revealing the outcome of a book or a movie. That’s pure entertainment. This is entertainment too, but it’s also news. As to the issue of whether poker coverage belongs in Sports or not — we can debate all night long whether poker should be considered a sport. We take no position on that. By placing it here, we are merely indicating that people who follow sports, moreso than other sections of USA TODAY, are most likely to be interested in the World Series of Poker. Can we talk, legend to legend? Michael Phelps made history at the 2008 Beijing Summer Olympics by winning a record eight gold medals. And his comments to the press about wanting to play some poker in the future garnered much attention from the poker community, as in offers from the Asian Poker Tour and Betfair regarding the WSOP Europe. Neither offer was accepted. It seems that the swimming legend does things on his own terms. 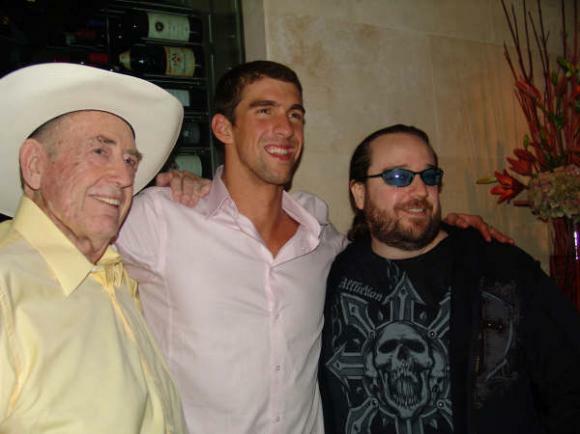 Phelps recently traveled to Las Vegas with some friends as guests of the Palms, and one of his wishes was to meet Doyle and Todd Brunson and Hoyt Corkins. Maybe one of these days he will accept an offer. Swimmer Michael Phelps came off an historic Olympics with eight gold medals. And in one of his numerous post-feat interviews, he mentioned that he might like to play in the World Series of Poker. Suddenly, offers were coming from poker tournament organizers like the Asian Poker Tour. Another offer can be added to the list, courtesy of Betfair, the official sponsor of the World Series of Poker Europe. Even though Betfair worded it with already-overused terms like “human dolphin” and “shark,” the site offered Phelps the chance to play in the WSOPE later this month, even offering to pay the Â£10,000 buy-in to the main event on his behalf. And then the statement on Betfair ruined it with this: “Phelps will be free to wear his famous LZR swim suit at the table although organizers fear it may not give him the same competitive edge outside of the pool.” No word on any response from Phelps. Re: How Many Olympians Have Played in the WSOP? Michael Phelps seeking seat in the WSOP? Soccer is more dramatic/difficult/painful (to watch) than poker. Sigh.